You are here: Home / Arts / Death a Romantic Comedy at the Victoria Fringe 2018. An interview. UK word wizard Rob Gee has been a popular addition to the Canadian Association of Fringe Festivals (CAFF) circuit with many appearances at the Victoria Fringe Festival. 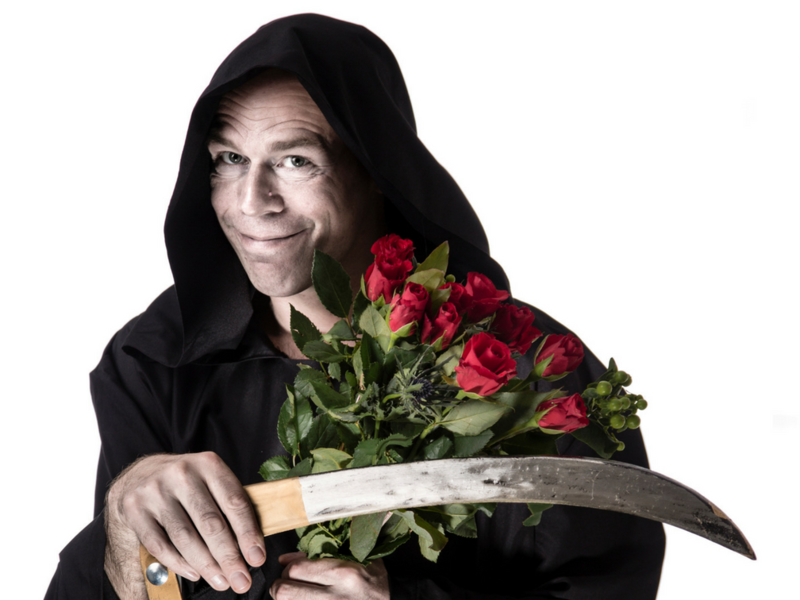 He’s back with his latest (and newest) show Death A Romantic Comedy. How long have you been producing work on the Fringe circuit? As an artist/company? When did you first come to Victoria—shows you’ve presented here? I’ve been performing fringe festivals for 19 years – my first was Edinburgh in 1999. I did my first Canadian fringe in 2006 and I’ve not done the Edinburgh Fringe since. Why would I? 2006 was my first year in Victoria and this will be my eighth Victoria Fringe. Good Lord. This show is brand spanking new – I was still writing it on the drive to Winnipeg! It was broken in there, it does Edmonton next, and Victoria will be its third fringe. Hopefully it’ll then tour a load of other fringes next year. Ahhh – this time last month it was barely a twinkle in my eye! It’s very new indeed. I’m pleased to report previous shows have won a veritable avalanche of awards between them. I’m also a performance poet by trade, so I’ve won quite a few poetry slams, but it’s been a while since I did all that slam malarkey. Yes, it originated from the cancer comedy commission mentioned in the press release. I came to realise that over the last few years, I’ve written comedy about dementia, cancer, terrorism and mental illness. I thought I might as well go the whole hog and see if I could do death. Think of a good title – the kind of title you yourself would like to go and see. It doesn’t have to be tasteful. Book some fringes and/or venues. Do nothing for a significant period of time; because life is more important than art. Panic and drink a lot. Bang out a first draft between hangovers. Bore as many friends as you can with this draft. They can help make it better. Learn it as best you can, then expose it to the good people of a very small fringe, ideally London or Regina. Then rewrite. All went to plan, although I first exposed it to the good people of Winnipeg Fringe, which is a big one. It went okay though. Also, it’s both kinds of funny. It’s the right kind of wrong. It’s like a fart that doesn’t leave a bad smell. Laughter, lots of laughter! And a bit of contemplation. I think you’ve covered it all! Tragedy Time Served Comedy by Mark Hughes. Victoria Fringe 2017. An interview.